Brett L. Smith is a First Vice President of American Business Bank and has 20 years experience in the commercial banking industry. Mr. Smith is a senior commercial banker as well as one of the bank’s senior credit authorities whose focus is to work with established locally owned businesses with annual sales of $10 to $200 million. He works with a variety of industries but focuses on the food industry, sub sectors of manufacturing, and the construction industry. Brett has a very close relationship with his clients, which includes being a trusted resource on complex financial matters, best practices and long term planning. 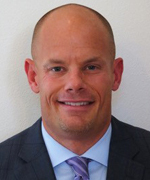 Mr. Smith is a graduate of the University of Arizona and received a double major bachelor degree in Finance and Marketing. Brett also graduated with honors and in the top 3% of his class from Pacific Coast Banking School, a three year graduate level program at the University of Washington. Brett is also involved in the community as he serves as a member of the Finance Committee of the River Church of the South Bay and Able Arts Work in Long Beach. He is a native of Los Angeles and lives in Palos Verdes with his wife and two children.